June 28 was a busy day for weddings. A Silver Strings trio was dispatched to Benton Chapel that afternoon to play a mostly traditional wedding music for the wedding of Lindsay and Dustin. Lindsay chose “Canon in D” for her processional but threw tradition to the wind for the recessional, exiting with her new husband to the strains of “Wagon Wheel” played by master fiddler, Julianna Waller. Benton Chapel is a lovely sanctuary with clean lines and wonderful acoustics. Unfortunately I wasn’t able to be a part of this celebration but did get some pictures of the rehearsal. The love among the family members was abundantly clear and I have every confidence that this is a match made in heaven. Congratulations to Lindsay and Dustin and their families! On June 26, 2014 Silver Strings had the honor of performing the music for the wedding of Jeremy and Shanique at the Foundry located near Marathon Village. We were a quartet again and warmed up the guests with songs like “Signed, Sealed, Delivered” and John Legend’s “All of Me”. We played a mix of traditional and contemporary music for the processionals…”Jesu, Joy of Man’s Desiring” for the families and Stevie Wonder’s “Overjoyed” for the attendants. A most precious part of the processional was a young fellow acting as the Town Crier carrying a sign that said “Here Comes the Bride”. The small stage at the Foundry was filled with smiling attendants beaming as a stunningly beautiful Shanique approached the altar to a recording of a friend of theirs, Michael Hicks, singing “A Song For You”. It was a very wonderful and dramatic processional. Blessings to Jeremy and Shanique and may they live happily together and prosper. On June 21, 2014 Van married his sweetheart, Mandy, in a lovely ceremony at Belle Meade Plantation. The weather cooperated but just barely, spitting a little rain on us shortly before we were to begin the prelude music. The guests were seated facing the mansion and were able to see Mandy’s face as she approached the love of her life to the beautiful “Canon in D”. After the ceremony everyone made their way to the Carriage House where the Silver Strings quartet entertained with a selection of contemporary rock as per Van’s request (yes, the string quartet plays rock and even enjoys it) through the cocktail hour and dinner. At one point we did ask a couple of the grandmothers what they would like to hear and they gratefully asked for “The Way You Look”. We aim to please. Meredith Zeller of Bridal Blueprints was the very cool and unflappable coordinator. We so appreciate the planners/coordinators who know when to send the members of the wedding party to what music. May Mandy and Van have many happy years together. 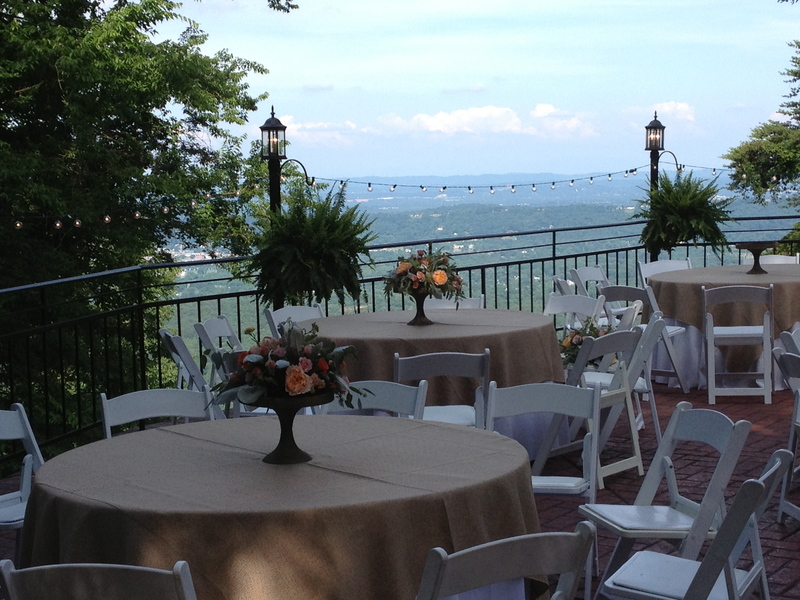 Reception at Lookout Mountain June 14, 2014. Road trip!! A quartet of us piled into Gary Tussing’s car for a trek to Lookout Mountain outside of Chattanooga for the reception after the wedding of Laura and Micah. We took the scenic route to avoid the traffic of Bonnaroo and saw some stunningly beautiful scenery. Worth the extra time for sure. We arrived at Grandview in plenty of time and got to see yet more beautiful scenery, a gorgeous vista from the back patio overlooking the Chattanooga Valley. As the bride and groom approached the reception we played “At Last” followed by “Everything” as they descended to the patio. Soon after their arrival we played Coldplay’s “Clocks” for their first dance, followed by “Unforgettable” for the father/daughter dance and “What a Wonderful World” for the mother/son dance. After the buffet many of the guests were in the mood to dance and we were happy to oblige with selections such as Journey’s “Don’t Stop Believing”. Several of the guests even knew the words and sang along with us at the top of their lungs. 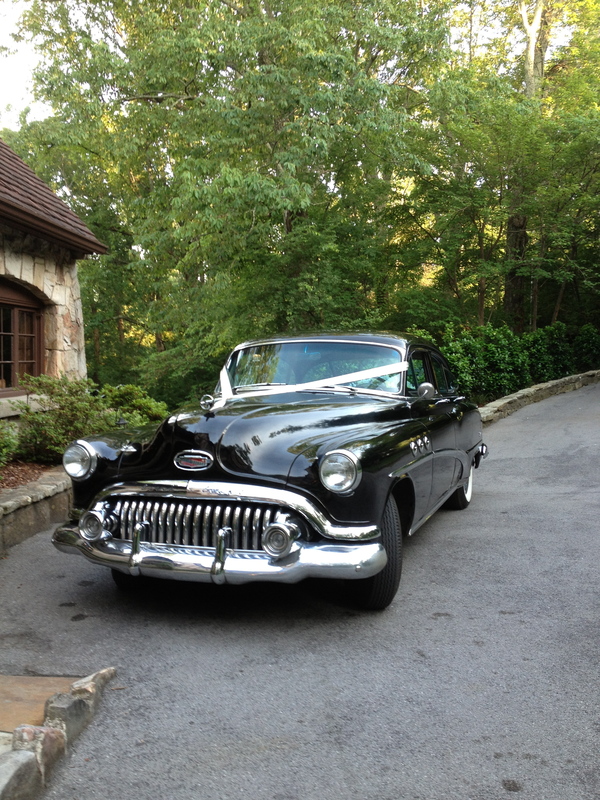 Outside awaiting to whisk Laura and Micah to their honeymoon a vintage Buick. I had to wipe the drool off the immaculate finish after after committing the sin of covetousness. Laura was such a lovely person to work with along with her mother, Emily. We were treated like royalty by the staff…very much appreciated after a long drive. Micah is a lucky man. 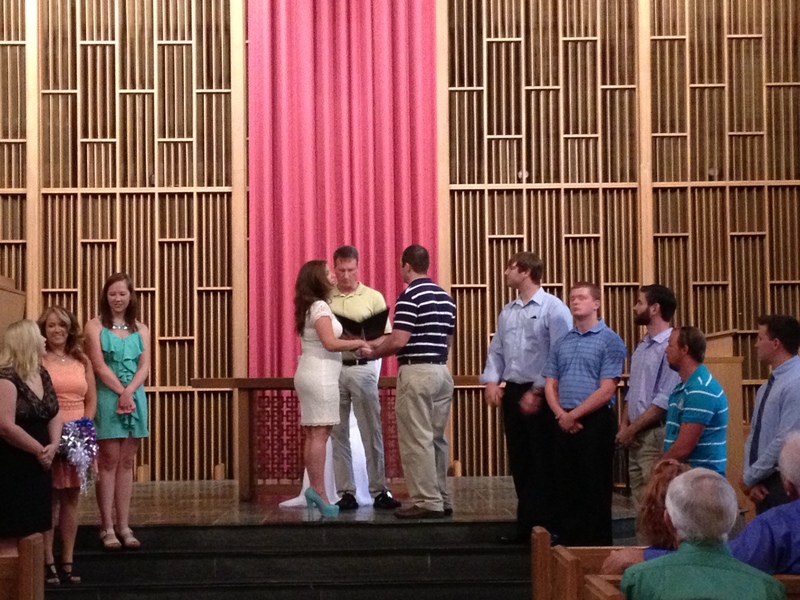 Best wishes to Laura and Micah for a long and happy life together. The Cannery is becoming quite a popular place for weddings these days. A trio of Silver Strings’ usual suspects convened to contribute our kind of music to the nuptials of Kristen and Alex. Kristen chose traditional music for the processionals including the familiar Wagner Wedding March, aka Here Comes the Bride and the Mendelssohn Wedding March, aka There Goes the Bride..with her Groom for their recessional. We were so grateful to be indoors for that wedding. As we played Kristen and Alex back down the aisle as husband and wife the heavens opened up and dropped a huge amount of rain in a short time. We hope they had a thunderously good time at their reception and send them off on their new life together with many well wishes. I also want to mention the capable coordinating of Kristen and Alex’s wedding by Sarah Goude of Regalo Design. We musicians depend on good signals from coordinators and Sarah and Damon have always done a great job. This party had to have been the coolest party yet. Angie and Lyndon invited their friends and family to an “engagement party”, telling only a couple of key people that they were actually getting married that evening. The scene was a lovely home of a friend…we should all have such generous friends. Because it was a second marriage for both of them, they didn’t want the fuss of a big wedding and thus the subterfuge. Silver Strings played pop and rock favorites to contribute to the virtual smoke screen so that guests wouldn’t know what was up. About 45 minutes into the party Angie excused herself to don her wedding dress and at a signal from Lyndon, we began to play “Canon in D” to bring her in to marry Lyndon right then and there with their offspring standing up with them. Congratulations to Angie and Lyndon and wishes for many happy years together. Last but not least for the month of May Silver Strings drove out to the Dickson County line for a wedding at Front Porch Farms. The weather was gorgeous, the scenery breathtaking and Melissa and Chase a beautiful sight getting married under the spreading oak tree. Their vows were traditional but so sweet. I’m not sure why I’m remembering the colors of the bridesmaid dresses this week…maybe because they were confections of colors that satisfied my virtual sweet tooth, the ones this time being a frothy pink. The two little flower girls, so cute in their little pink dresses, of course nearly stole the show. After the deed was done we all convened at the pavilion for the reception. Silver Strings played some fun music (Coldplay, Jason Mraz) for the cocktail hour after which we were invited to join in the buffet while a DJ took over. I was so delighted to see caterer, Mrs. J’s, delivering up scrumptious barbecued chicken with wonderful vegetables. This is my all time favorite caterer for sure. Congratulations to Melissa and Chase as they look forward to many years of joy and happiness together. In the middle of the afternoon of May 31 Melia and Josh exchanged vows in the beautiful lobby of the Schermerhorn Symphony Center. Just before Melia made the walk to her future husband, Sandy Merrill sang “When I Say I Do” accompanied by Silver Strings. Then Melia, absolutely stunning in her gown, came down the aisle on her father’s arm to meet Josh at the altar to the strains of “Con Te Partiro”, a favorite song of hers from her days in high school band. For this wedding the bridesmaids wore deep purple gowns along with the little flower girl whose frothy little dress of the same color looked good enough to eat. Melia and Josh exchanged their own vows after which they took their first communion. To close the ceremony we sent them back down the aisle to “This Will Be An Everlasting Love” and indeed it will be with all the palpable love that was felt among the newlyweds and their families and friends. Congratulations to Melia and Josh with best wishes for a long and happy life together. Wedding season has heated up along with the daily temperatures. We convened May 24 at Lillie Belle’s in Franklin for the wedding of Jennifer and Jonathan. One of the cool things about this was that Silver Strings saw Jennifer’s brother and his then fiancee down the aisle a few years ago. It was lovely to see them again. But I digress. It’s about Jennifer and Jonathan. 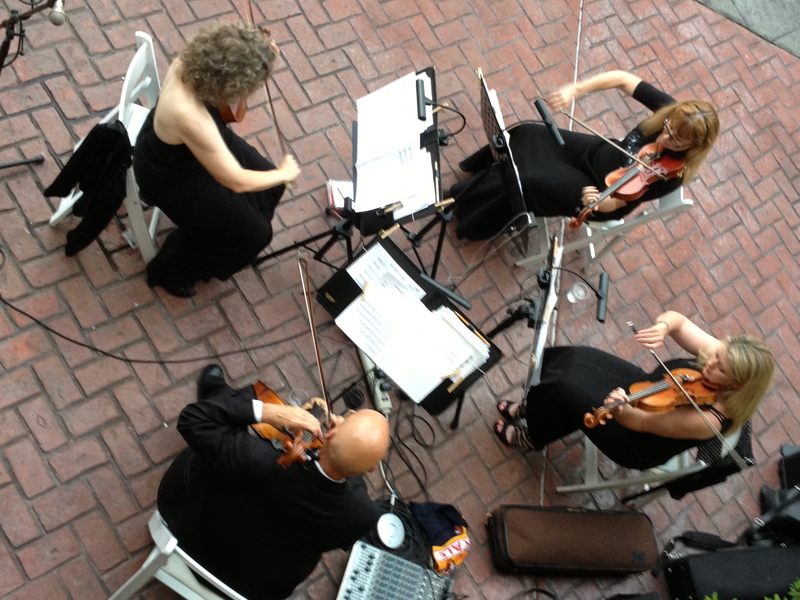 Silver Strings played a variety of lush tunes such as “Cinema Paradiso” and “It Had To Be You” for prelude. Jennifer chose “My Heart Will Go On” for her processional. With the able help of Nikki at Lillie Belle’s, we were able to time Jennifer’s entrance so that she was able to float down the aisle on her dad’s arm as the music came to a crescendo. You’d have to be made of stone not to be affected by that moment. I don’t always notice bridesmaid dresses but Jennifer’s attendants wore dresses of a gorgeous shade of violet. She’s a woman after my own heart as that has been my favorite color since I was a kid. The accessories and some of the flowers also matched. Beautiful. Congratulations to Jennifer and Jonathan with many wishes for a long and happy life together.